a book chick: "The Orphan Master's Son"
my take: My sisters and my daughters and I have a bit of a short hand talk for certain kinds of books: anything set in an oppressive country gets a "good BUT" ... as in A Fine Balance ... excellent read BUT it's INDIA ... or BUT it's communist China or BUT it's a slavery story, etc. A friend who reads the blog emailed me to suggest a couple books so I bought them without even reading anything about them. This woman has great taste in books BUT she doesn't know about the BUT disclaimer. WAH! It's set in NORTH KOREA. NOTHING GOOD HAPPENS IN NORTH KOREA. And it was fascinating once I got past the brutality. If you're not one for torture and deprivation and such, this will not be your cup of tea. 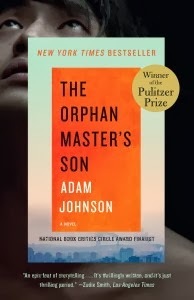 The story follows the orphan master's son through his job assignments from kidnapping Japanese citizens to a clandestine trip to the US to a labor camp and to the bed of the country's most famous actress. I was gutted reading this ... and reading it in the depths of a terrible mid-western winter was not a great idea. The deprivation and oppression and propaganda were mind-boggling ... the author took all the information he could find on North Korea (which is mostly from defectors) and added similar situations to tease out a novel about a very little known country. my verdict: really interesting read ... BUT it's NORTH KOREA. read in sunshine.